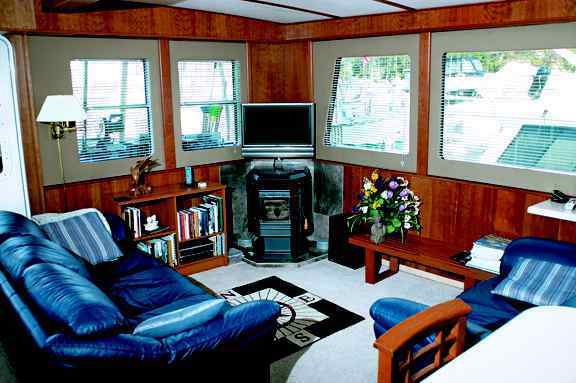 "Hi Bruce, We sure enjoy full-time cruising & living aboard. 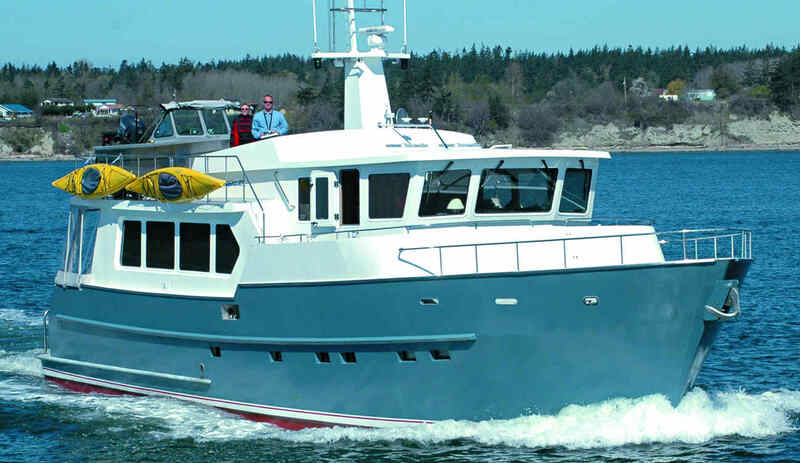 We've cruised from San Francisco to British Columbia and Alaska"
Each STUDY PLAN contains ALL the construction drawings for each material - STEEL, ALUMINUM, FIBERGLASS & WOOD EPOXY as applicable to the particular boat plan - with up to 25 sheets per plan! Lists of materials - Technical information - Numerous construction drawings are all included. SPECIAL INTRODUCTORY OFFER: BOAT PLANS & FULL SIZE PATTERNS (FIBERGLASS) OR STEEL OR ALUMINUM PLANS & CUTTING FILES... Delivered by DOWNLOAD to your computer within 12 hours of you placing your order. The plans have all the information you need to build your own boat..
Each plan contains all the construction drawings for STEEL or ALUMINUM construction, plus bonus drawings covering electrical, plumbing and engineering, everything you need to build your boat. These trawlers are designed in accordance with Lloyds for category 1 (unrestricted operating / sailing area), which is much better than the EU and other Classification Societies and the CE-A require. Complete stability calculations to USCG offshore requirements are included in the design package. All calculations are also cross referenced against ABS requirements to ensure that the design meets world-wide standards and specifications. 'World girdling Trawler Yacht' With it's displacement hull form this design is an ideal long distance cruiser. 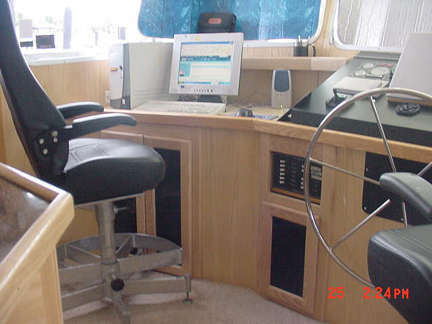 This is your opportunity to have your own passagemaking 'Voyager' designed and built at an affordable price. Now you can put those pieces together into one boat that you REALLY like ! Consider customizing one of our new designs. Bring us YOUR ideas. We can offer Steel or Aluminum boat plans and Cutting files, CUT-TO-SIZE KITS or Part-Built or Complete Boats. NEW PASSAGEMAKING DESIGNS: This is your opportunity to have your own passage-making 'Voyager' designed and built at an affordable price. Now is your opportunity to put those pieces together into one boat that you REALLY like ! Consider customizing one of our new designs. Bring us YOUR ideas. We can offer Steel or Aluminum boat plans and Cutting files, CUT-TO-SIZE KITS or Part-Built or Complete Boats. LARGER VERSIONS AVAILABLE AS CUSTOM DESIGNS. TY 620 - Bruce, I had reply from ROYAL YACHTING ASSOCIATION on the plan evaluations. They have been very quick and say they have no concerns about suitability for Design category A (unlimited offshore). They made a nice compliment on the quality of your plan information. L.O.A. 18.90 m 61' 11"
L.W.L. 17.17 m 56' 4"
BEAM 5.53 m 18' 2"
DRAFT (Full displacement version) 1.82m 6' 0"
Another TY 620 - this one built in South Korea. 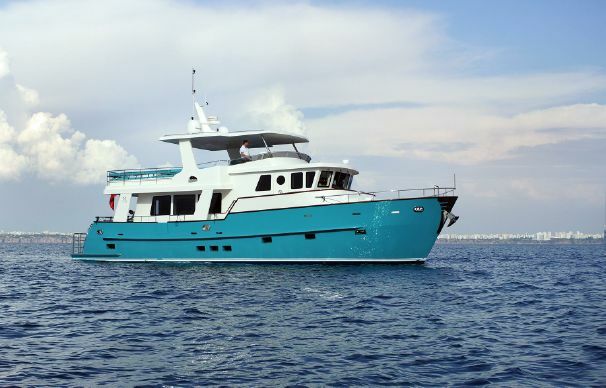 Deniz Ataca from Turkey has sent us a copy of the full CE certification documents along with many photos of his completed TY 620 - all of this information will be of interest to anyone building this well proven trawler - Over 30 in service world-wide and lots of performance information is available from many owners. SEE FULL REPORT ON THIS BOAT IN PASSAGEMAKER MAGAZINE .. ALSO INCLUDED IN THE STUDY PLAN PACKAGE ON DOWNLOAD or on USB which . . . GIVE ACCESS TO HUNDREDS OF BOAT AND KIT ASSEMBLY PHOTOS. 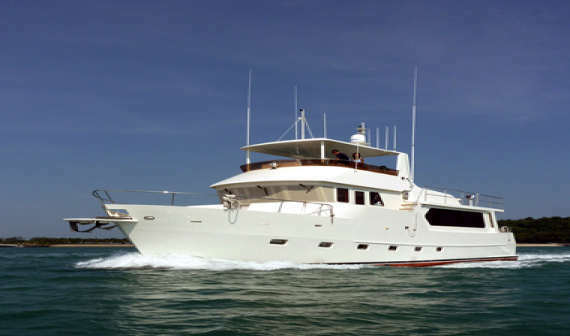 From owner of TY 620 "MY BLUE STEEL"
This was the start of her 2,600 nm trip to the Singapore, with stops planned in the Philippines and Kota Kinabalu, although the boat had sufficient range to complete the trip non-stop. 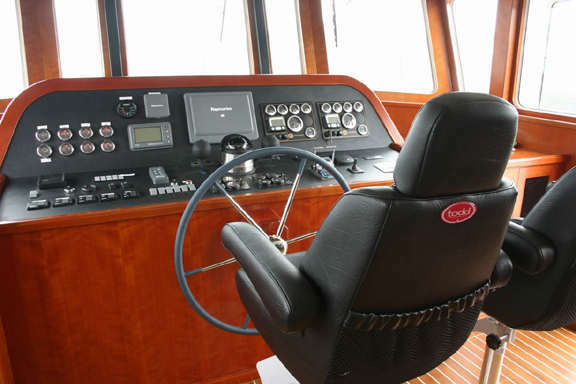 The Owner is very satisfied with the interior and sea trials; max speed about 12.7 knots with twin 235HP John Deere at 2000 rpm and 7.0~7.5 knots with one engine at 2000rpm. Onboard were Mr. Rod Steel as the Owner/Skipper, his partner Angie Sach, Mr. John Holbrook and Mr. Alistair Dow. “MY Blue Steel” arrived in Singapore, where she will be based, on 14th January 2010 and is available for viewing there by prior arrangement. I am proud to build Bruce Roberts designs, which I am very impressed with, and thank you for your assistance in marketing GHI Yachts Korea. 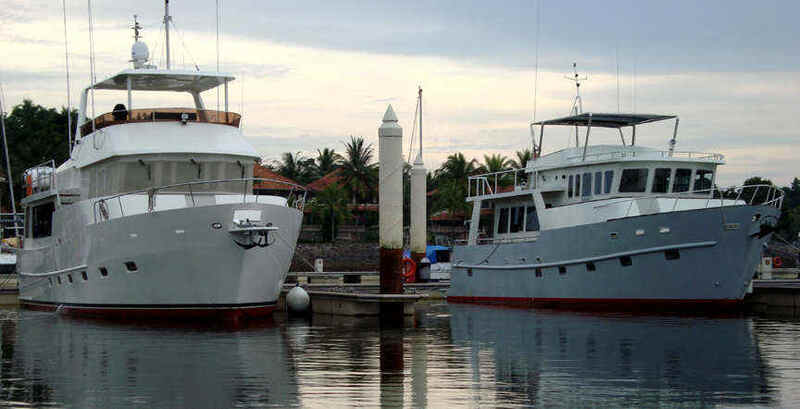 As you know, we have built to your design (1) Trawler Yacht 43 (2) Trawler 620 (3) Voyager 495 and (4) three Voyager 388 ( first one to be completed and launched on January 30, 2010). PHOTOS of V388 to be sent on January 2010. YOUR OWN FOR LESS ! Voyager TY 620-A NOTE: Side decks beside salon. 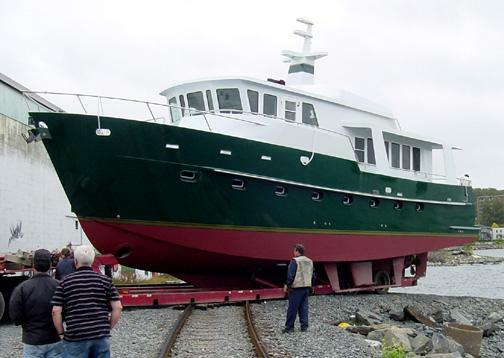 Tom Springer's NEW Trawler Yacht launched in Canada. Saloon and Pilot House layout. Other layouts are possible to suit your choice. 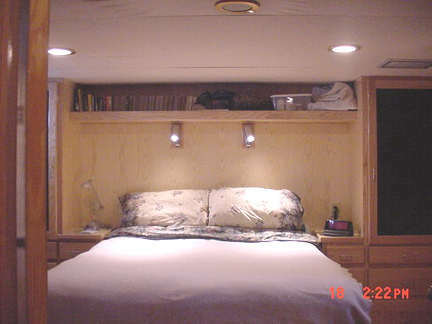 Below decks layout can be varied to suit your particular requirements. STUDY boat plans: Show alternate layouts. The TY 620 houseboat could be powered by twin outboards, stern drives or Yacht drives ... the amount of horsepower would depend on the type of cruising you have in mind as well as general operating conditions you expect in your area. CONTACT BRUCE for additional information on building your mobile house boat. Boat plans & Full Size Patterns now available. SEE MORE EMAIL BRUCE If you are interested in this Version ! This new design was conceived because this is the minimum size of trawler where an aft stateroom and a level salon / aft can be combined to make the perfect 2 stateroom / 2 double guest cabin accommodation. 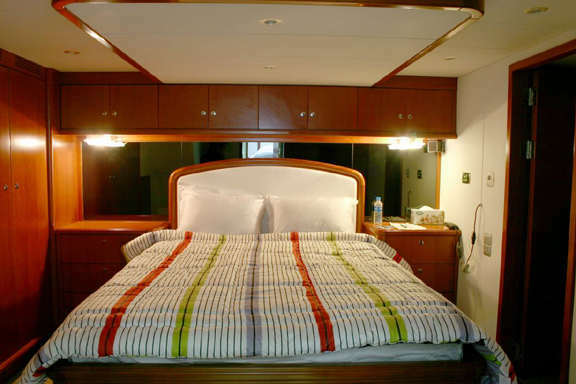 It is possible to create an aft stateroom in a trawler of shorter length BUT this means it is necessary to raise the aft deck to provide headroom in the aft stateroom with the resulting requirement of stairs from the main salon up to a raised aft deck. 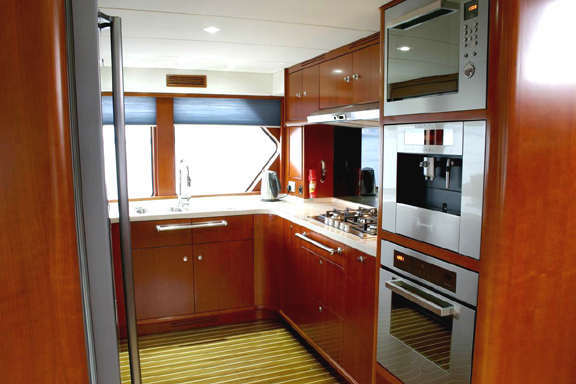 This arrangement is often seen in smaller craft but is less than desirable if you can afford the luxury of the perfect layout of the Trawler 650. For those whose cruising area requires a shallow draft vessel, and then it is possible to reduce the draft to 4 ft – 1.22 m by using twin tunnels. If you prefer an ‘performance trawler’ that is one that can achieve say speeds in excess of 20 knots then again this is possible but the preferred building material in that case should be either aluminum or fiberglass. 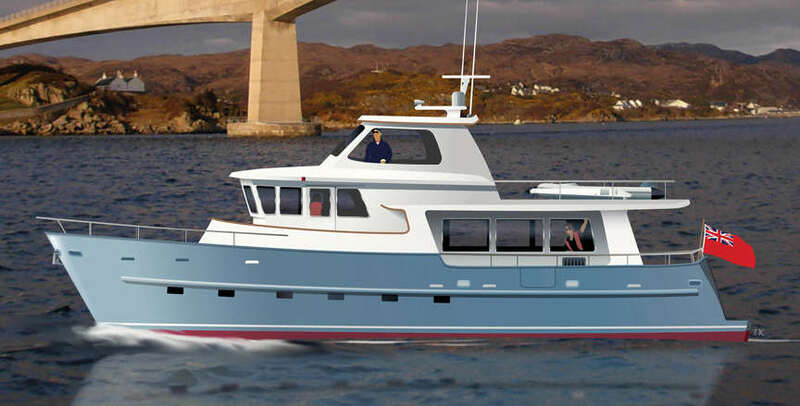 As you can see this new design offers a wealth of possibilities as a long range serious cruising trawler and some versions will be suitable for the addition of sail assist to make extended passages possible while saving fuel under favourable conditions. NEW CUSTOM boat plans IN FIBERGLASS OR WOOD EPOXY. Many of you admire our range of kit designs but you would prefer to build in other materials … Consequently we have had many requests to provide alternative custom boat plans for building in fiberglass or wood epoxy. 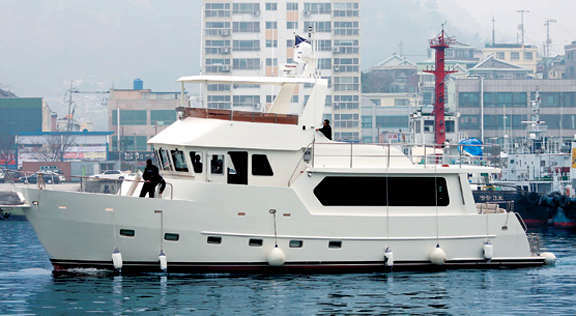 This full displacement world girdling trawler yacht is available with FULL WIDTH SALON or as REGULAR SIDE DECKS VERSION Cutting files available or delivered as a steel or aluminum pre-cut package. The Voyager TY 620 is available as a kit in either aluminum or steel. ... FIRST TWENTY SOLD ... If you are interested in a trawler yacht of this size and style now is the time to join in the design process for YOUR version of this vessel. Options include Steel construction, Semi-displacement or full displacement hull, single or twin engines. "As we worked, more and more respect came to Bruce Roberts for his designs. Things that made no sense came to understanding as we flowed through the process"
Hi Bruce, Sorry for not writing sooner. We are really enjoying the project. I have a friend that comes to work on the boat in the evening just for the relaxation. We are almost finished welding the hull. We will build the house and pilothouse on a gig on the ground. I must remove for transport and feel there are benefits to building on the ground. I will lift into place before moving to make sure everything fits. We are making some changes from the original layout to better fit my needs. 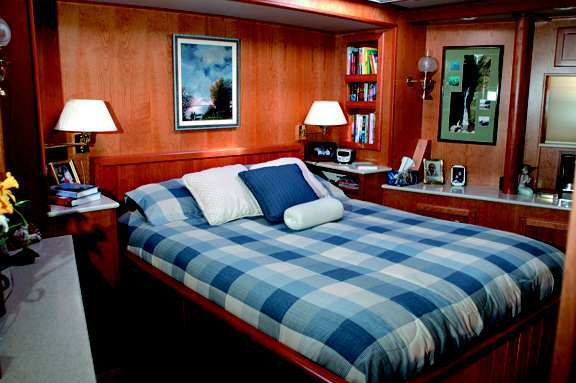 We've traded the amidships stateroom for a good sized head, pantry and shop/mechanical room. I will install all plumbing, electrical, day-tank, fuel management and heating in this room. Hi Hal, We have bounced back and forth between DC and Hydraulic thruster' s and have finally decided on hydraulic mainly because we would need a 48 Volt thruster and that meant 12v, 24v, & 48v DC and we just think we would rather have one dc voltage (12V). We had sized the generator for hydraulic anyway so it just makes sense. within a month and my wife and I will retire in April and work on the interior full time. I am anticipating that work to take 3 to 4 months which is longer than it took to do all the rest. Janet and I are very impressed with your design and would highly recommend both of you to anyone who asks. We will continue to send pictures and updates as we begin our part of the project. Bruce, I had reply from RYA on plan evaluations. They have been very quick and say they have no concerns about suitability for design category A. Nice compliment on the quality of your plan information. Everything seems to be OK. They used Naval Architecture Services LTD in Hampshire. 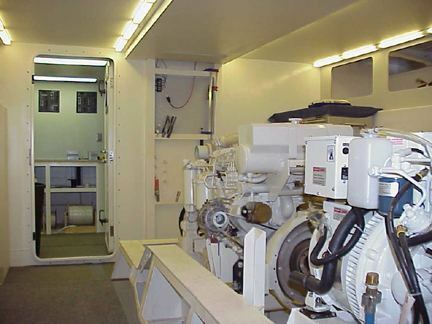 LR SSC service group G6 (unrestricted yacht) .